According to CNN, "The eruption of an Icelandic volcano, which had slowed in recent days, strengthened Monday, spewing a new cloud of ash that officials said was heading toward the United Kingdom, possibly posing a renewed threat to air travel." 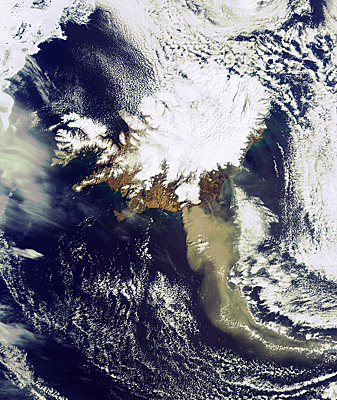 The photo at right was taken early Monday afternoon by ESA’s Envisat satellite. It shows a heavy plume of ash from the Eyjafjallajoekull Volcano. The new plume is 400km long. Meanwhile European airlines are touting the results of "test flights" that apparently show no damage to engines. On Lufthansa's recent test flight the pilot scrupulously avoided any area known to have heavy concentrations of ash. Such tests prove nothing. "While it remains possible to find clear air high above us, this doesn't necessarily mean there are no pockets of high concentrations of ash at the various flight levels," Mr Yates said. "I would therefore suggest it's better to err on the side of caution." The fact that airlines may have successfully pressured regulators to partially open Europe's skies Tuesday, is no guarantee that it's safe to fly.